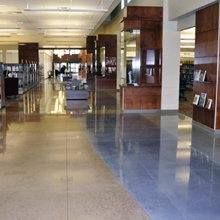 Modena by Bomanite is an engineered interior cementitious topping that is blended with selected aggregates and then ground and polished to the desired gloss level. The Modena system transforms existing or worn surfaces into beautiful walkways, showrooms and lobbies and is available in a range of colors and patterns using decorative sawcuts. Additional topically applied stains and a variety of aggregates, such as recycled glass or porcelain along with regionally sourced materials, are all options in creating a beautifully designed, environmentally friendly and functional floor. The Modena system is a low-cost alternative for renovation projects and provides the durability and strength for this exceptionally long lifespan system. With the industry’s lowest lifecycle costs, low to zero VOC and minimal maintenance requirements, Modena by Bomanite is the optimal choice for renewed surfaces. Bomanite Modena SL: A bonded topping with 1/8” aggregates applied to cured concrete. Bomanite Modena TG: A bonded topping with 1/4” to 1/2” aggregates applied to cured concrete. Bomanite Modena MONOLITHIC: A monolithic topping with 1/4” to 3/4” aggregates applied to plastic concrete. Once cured the Modena topping is ground to expose the desired amounts of aggregate, then polished to the required gloss level and treated with a Bomanite stain resist. The primary benefits to Modena by Bomanite are the range of colors available, the aggregate characteristics, the excellent durability of color and the ability to transform ordinary concrete into highly decorative flooring.